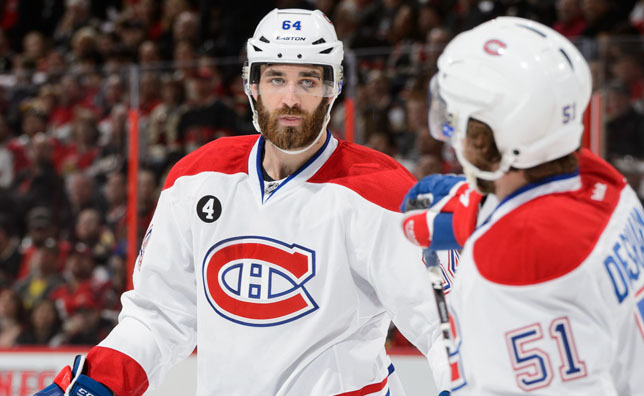 MONTREAL – Montreal Canadiens general manager Marc Bergevin announced Wednesday that the team has agreed to terms on a two-year contract extension with defenseman Greg Pateryn (2016-17 and 2017-18). “We very pleased to have reached an agreement with Greg Pateryn. Greg is a young defenceman who has developed very well. He enjoys the physical play and brings more depth to our defensive group,” said general manager Marc Bergevin. Pateryn, 25, took part in 17 games with the Canadiens in 2014-15. He served six penalty minutes and delivered 48 hits with a 12:39 time on ice per game. The 6'2'' and 222 lbs defenseman played seven playoff games with Montreal, recording three assists. Pateryn added 15 points (3 goals, 12 assists) in 53 games with the AHL’s Hamilton Bulldogs. Since making his professional debut in 2012-13, Pateryn has played 20 regular season games with the Canadiens. With the Canadiens’ AHL affiliate in Hamilton (Bulldogs), he has tallied 61 points (25 goals and 36 assists). A product of the University of Michigan Wolverines (CCHA), Pateryn recorded 43 points (6 goals and 37 assists) in 142 games at the collegiate level. A native of Sterling Heights, Michigan, Pateryn was drafted by the Toronto Maple Leafs in the fifth round, 128th overall at the 2008 NHL Entry Draft. He was acquired from Toronto on July 3, 2008 along with a second round draft pick in 2010, in return for forward Mikhail Grabovski.